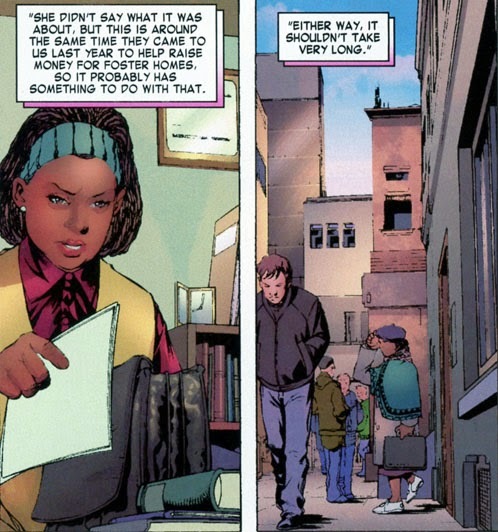 When we last saw Simone Debouvier of NYC's Child Welfare division, she had just made an evaluation of the home environment of Franklin Richards and his sister as part of her office's investigation as to whether his parents were adequately providing for their safety and well-being. Let's not sugar-coat things--Ms. Debouvier's initial report to her supervisor is likely to be frank, and unfavorable. But the lady is a professional, and there are admittedly extenuating circumstances where the Richards family is concerned--so it's to her credit that she's willing to continue the investigation with something of an open mind, though she's probably made it clear in so many words that her mind is 80% made up. Why not a "safe room" for the kids? 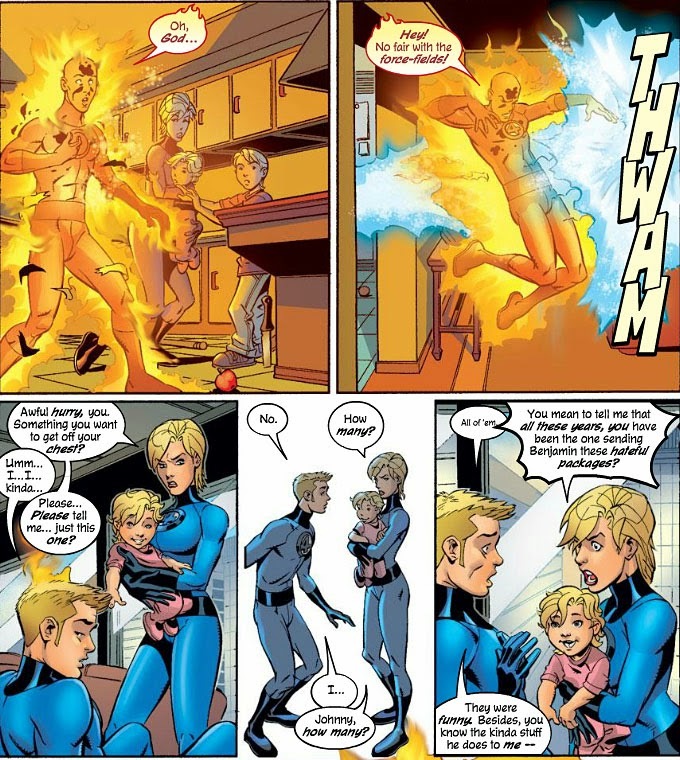 Other families have fire drills in their home--why not extend the notion to have a plan for the kids when there's a sudden danger situation in the Baxter Building? 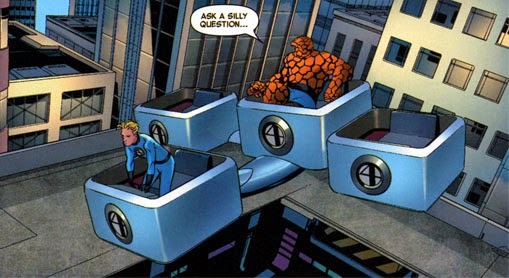 One of the FF speaks a special code which triggers an alarm that the kids are trained to instantly respond to--they head for the safe room (designed by Reed, of course) and ride out the trouble until Mom or Dad comes to retrieve them. There could even be a network of pneumatic tubes that they can step into wherever they are at the time, and be whisked to the room in seconds. The safe room can even be located off-site, just for good measure. At any rate, Sue has done her best--but Ms. Debouvier of course will need to meet with the children's father in order to make a more informed assessment at this stage. 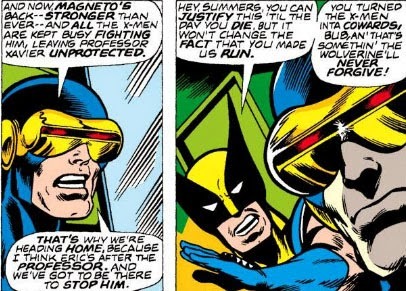 And in this second meeting, Reed finally returns to find out about this development. 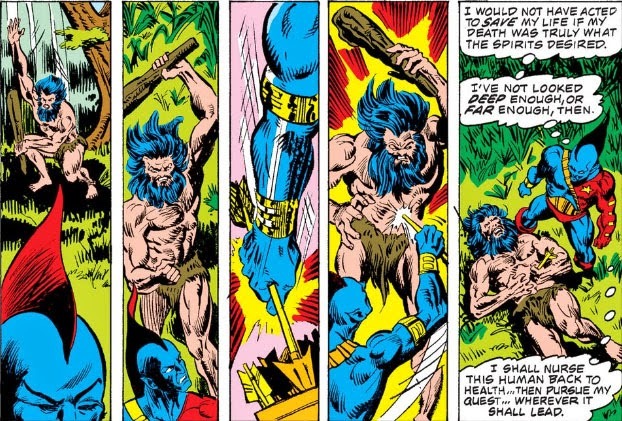 But Reed's famous for thinking on his feet, right? 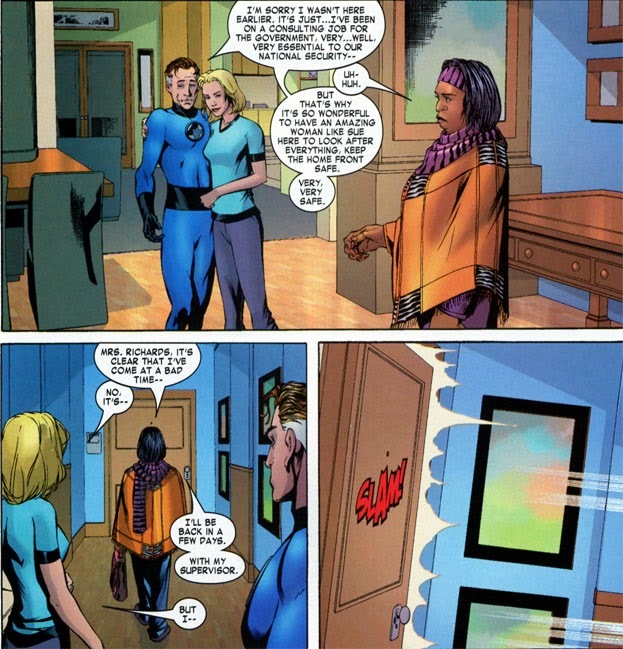 And with Reed and Sue presenting a united front, hopefully they can make some headway with Ms. Debouvier. Unless Reed happens to be on the run from the Feds, that is. I have a feeling Ms. Debouvier may get a nice tour of the Negative Zone when she comes around for her next appointment. I think I may scream. 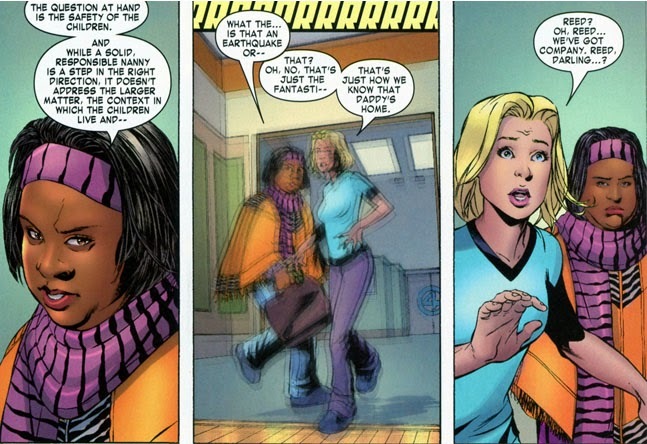 Yes--Zzzax is involved in a love triangle. "...the first issue of MARVEL PREVIEW--a one-dollar wonder which will showcase a fabulous new feature each and every ish! 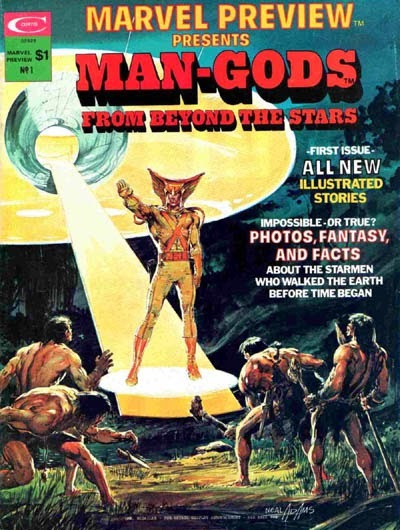 Our maiden voyage: MAN-GODS FROM BEYOND THE STARS! 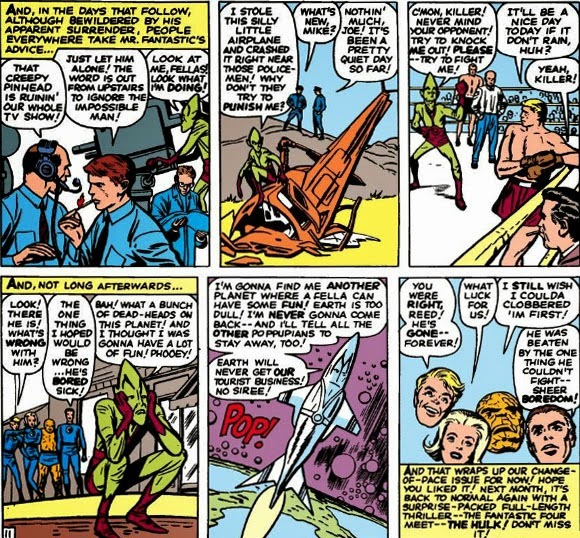 And if this stunning science-fiction tale of earth's first alien visitors doesn't knock Von Daiken [sic] and company right out of their chariots, then we're taking the first flying saucer out of here!" 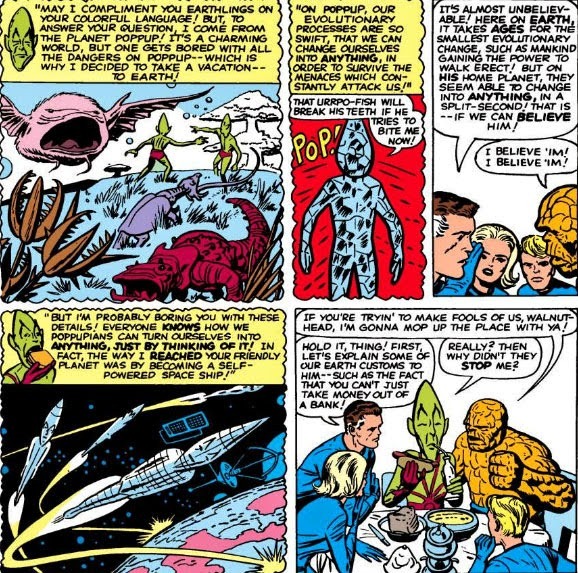 I dare say many works since von Däniken's book jumped on board the story potential of aliens visiting our world and influencing our culture and development in primitive times--so it's no real surprise to see Marvel green-light both the "Man-Gods" story and, a year and a half later, a more formal approach with Jack Kirby's The Eternals and its focus on the Celestials. 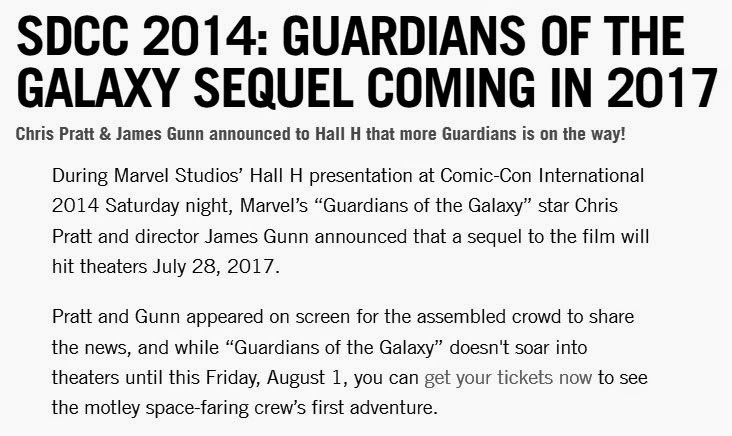 Marvel Preview also introduced the Star-Lord and Rocket Raccoon characters before ending its run (as "Marvel Preview") in late 1980. (a) Everyone involved is convinced that this puppy is going to be a hit. (c) The "planned" sequel will be "reconsidered" and cancelled. Personally I'm pulling for Possibility (a). 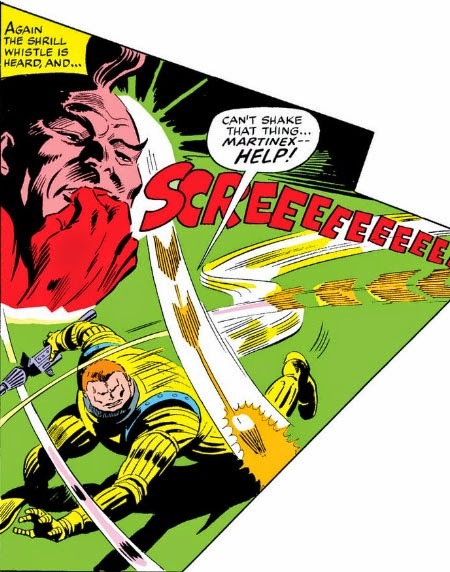 Reading those old Tales of Suspense or Strange Tales comics, where the stories of two Marvel characters each occupied half the book, often felt like you were reading Sunday comics strips, especially if they were continued stories--a lot of adventure being crammed into a limited space, with the ending promising more to come. It was amazing how much story was being presented in just ten or eleven pages--though the story's frenetic pacing probably helped in that respect, with the characters often racing about in a time-is-of-the-essence, it's-do-or-die! mindset. 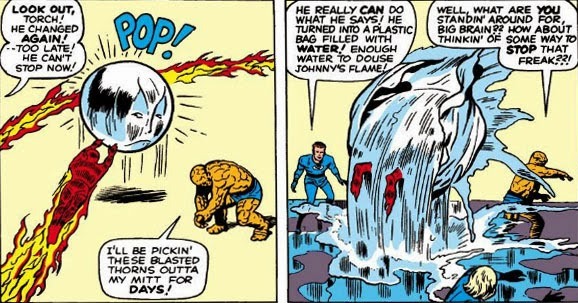 Before Doctor Strange's first costume change, it was difficult to imagine the "man of mystery" becoming desperate or exited about anything, with his aloof and mysterious demeanor and a tendency to meet even a crisis with calm detachment. Perhaps the change of costume was to help market him as a more active character, rather than an enigma who stepped out of the shadows to deal with a mystic menace. Perhaps having him gunned down in one story was overdoing it a bit, but you get the point. 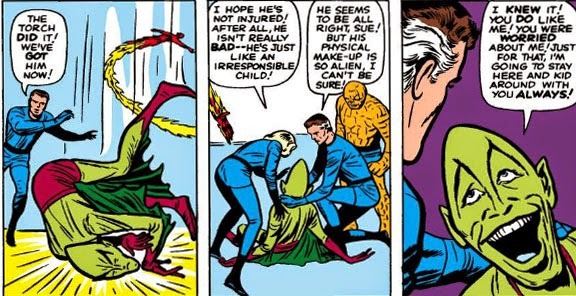 Strange's first meeting with Eternity is a good example of both of these observations. 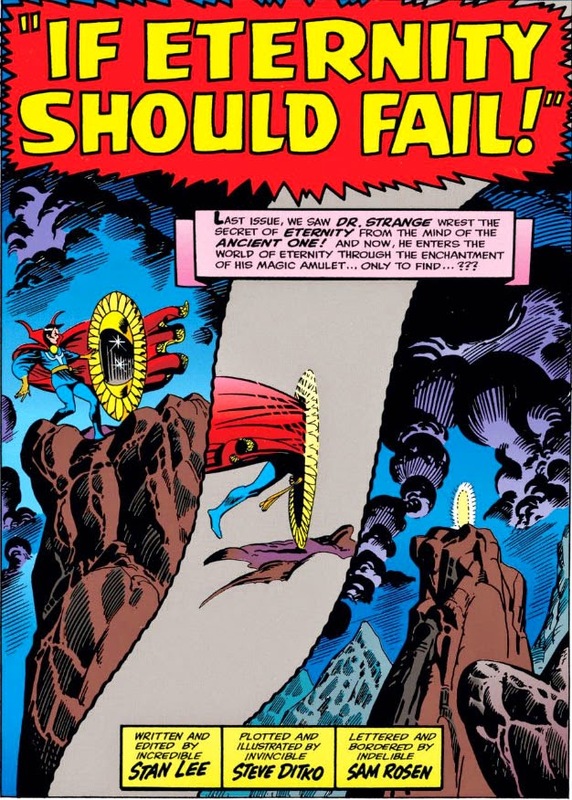 Strange is being hunted; the Ancient One has been targeted; Dormammu has allied with Strange's mortal nemesis, Baron Mordo; and to help the Ancient One, Strange must seek out the entity known as Eternity. The man definitely has a lot on his plate, and the stakes are high for this mystic who was once content to confront haunted houses. 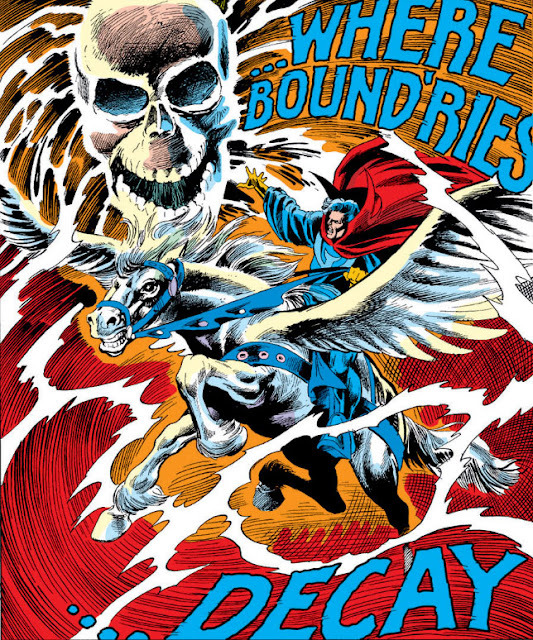 Eternity, meanwhile, has received a great deal of build-up in the last few issues, with Strange on a race against time to discover the secret of how to contact him; and now that the moment has come for the fateful meeting, the story dials back the manhunt aspect in favor of the drama of discovery. 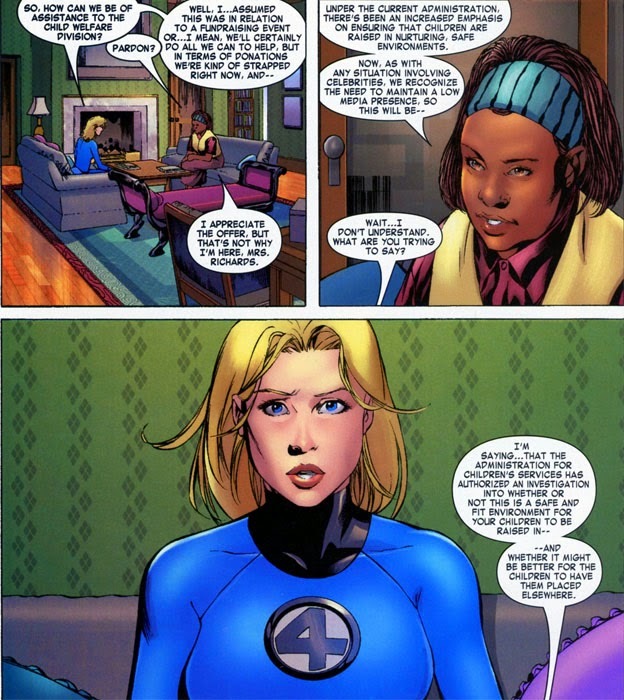 When it comes to the Fantastic Four, we're often curious as to how this super-group copes with the day-to-day matters that you and I must tend to on a regular basis. Fortunately, we don't have to drop everything (and, if we have children, everyone) when a crisis arises that demands our intervention--that is to say, we don't have to do so nearly as often as the FF seem to. Nor do we have to cope with "home invasions" on anything like the scale the FF find themselves victims of. 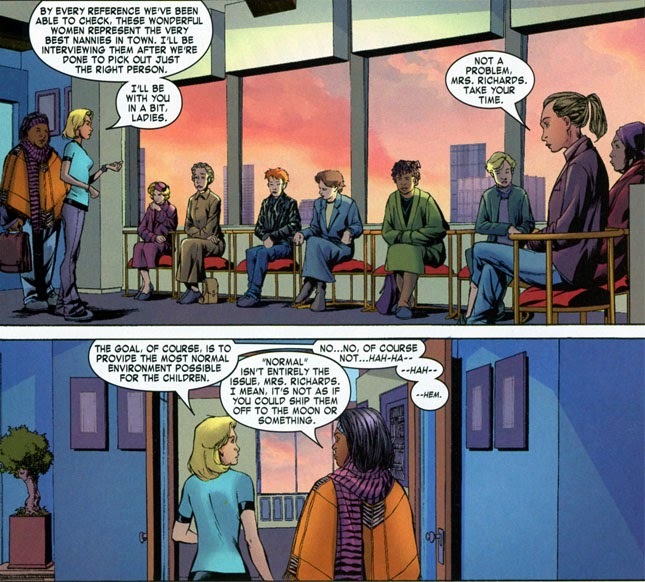 But the meeting between Sue and Ms. Debouvier won't exactly be filled with pleasantries. 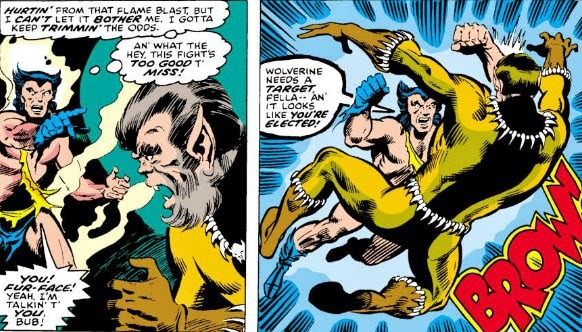 The Deadly Attack of--The Wolverine! 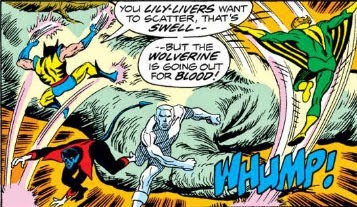 Let's face it--nobody can make his own name resonate in an opponent's head like Wolverine. 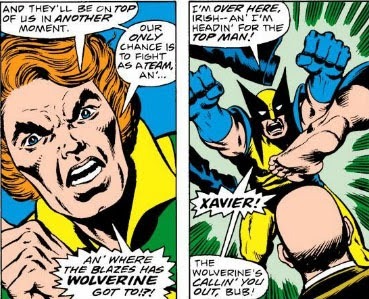 But remember the days when Wolverine used to attach an article to his name for good measure? 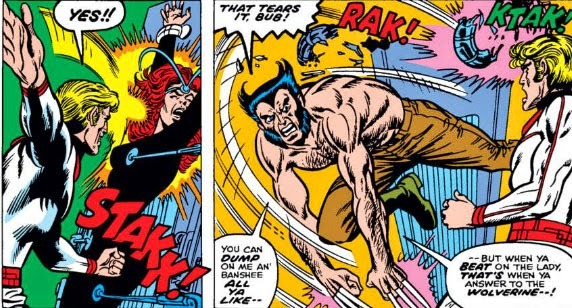 Heaven knows Wolverine's reputation preceded him--but when you saw "the Wolverine" coming at his victim, it gave his attack that little extra jolt of terror, didn't it? 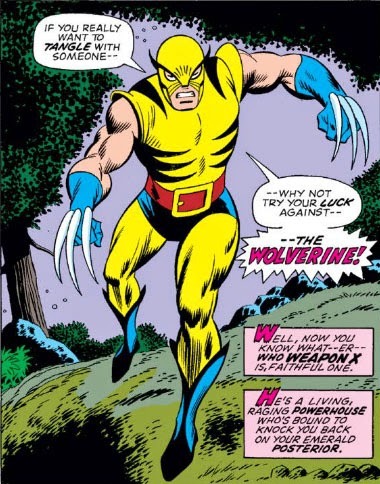 So let's take a moment to remember when the Wolverine, rather than just "Wolverine," was making his name felt in the Marvel universe. In the second meeting between Dr. Strange, Master of the Mystic Arts, and the manifestation of Death, the encounter was an introspective one, as Death sought to co-opt the mage by weakening his spirit and showing him the effect that death has had on his family and, by extension, his own path which led to the end of his surgical career. 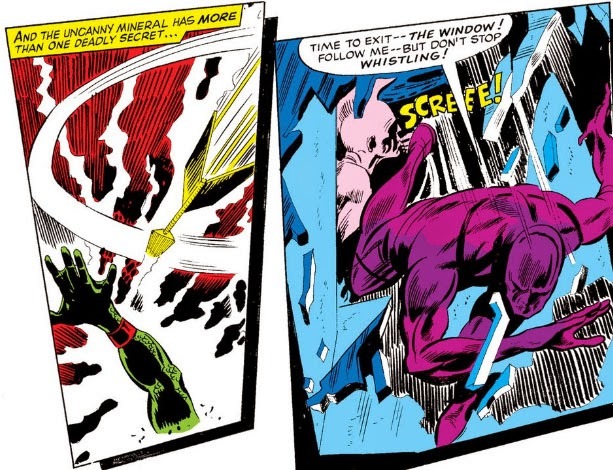 Death was obliged to take such a circumspect approach due to the fact that, with Strange's ascendance to his current level of power, he could no longer be taken by Death directly--and so Death resorted to a ruse, which would compel Strange to surrender his life willingly. Ultimately, Strange prevailed, which is astonishing when you consider that it makes him 2 for 2 in face-offs with Death. 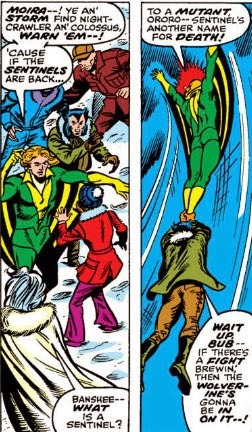 That would certainly make for impressive feathers in one's cap. 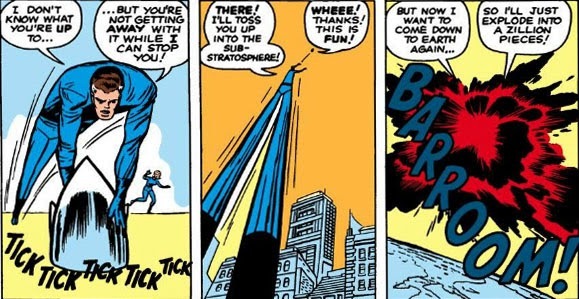 But, what about that first meeting, when Strange had to go head-to-head with Death without such impunity? We know that the man is good, but how could he possibly survive? To make a long story short, he did, but he didn't. 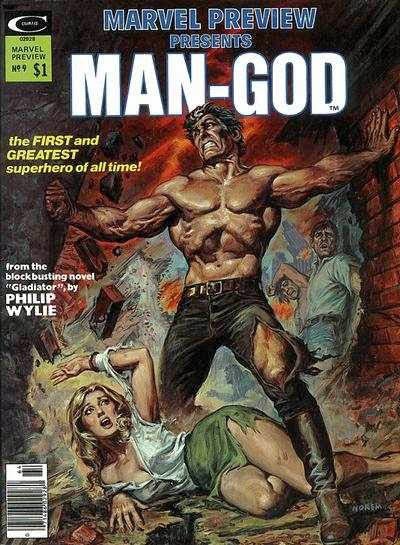 And while that sounds like they would have needed to change the title of the mag to "Dr. Corpse, Master of the Walking Dead" (come on, you know you'd read it), Strange managed to survive that encounter on a TKO. And any death you can walk away from is a good one, which this story will make clear. 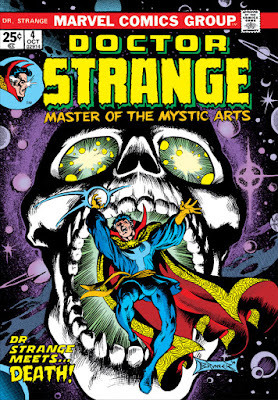 To give you some background to this encounter, Strange has found reluctant refuge from his fatal stabbing by the man known as Silver Dagger within the "unreality" realm of the Orb of Agamotto, and has steadily made his way back to the center of the orb in order to make his escape back to Earth. 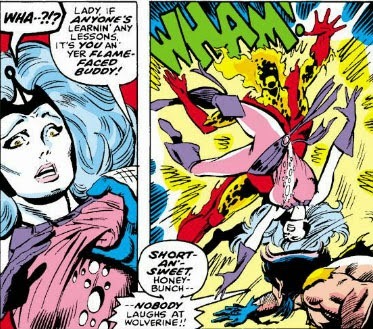 But as he nears his goal, he also makes himself vulnerable once again to death; yet he has no choice, if he wants to return to Earth as well as to save Clea from Dagger. Which will involve coming face-to-skull with an entity that has only one goal where the living are concerned. 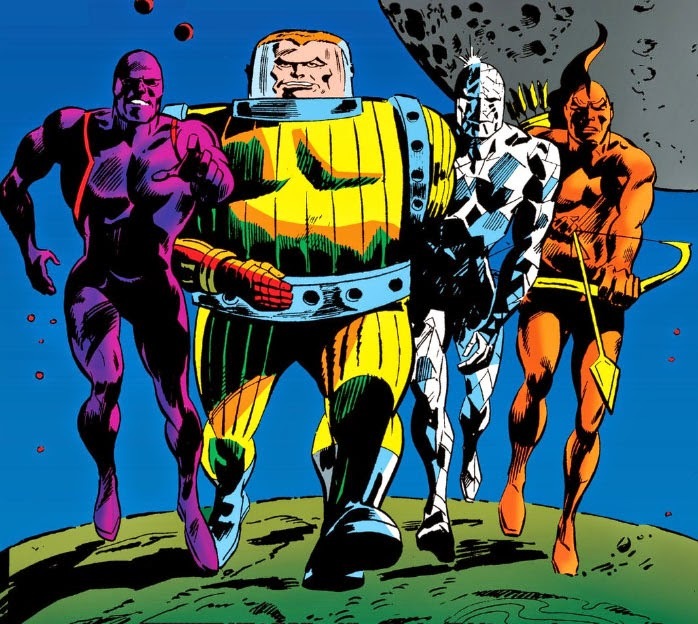 Practically every super-group Marvel has formed has had a character who mainly filled out the roster--someone who wasn't really in the same league as the other characters, but who was felt to have other things to contribute and who would serve to balance out the team's power quotient. 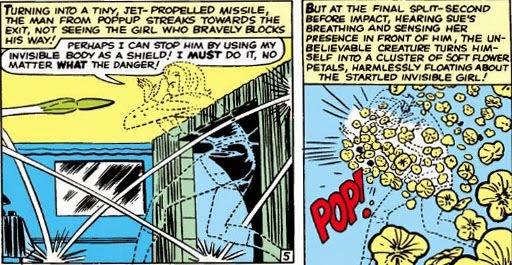 Ant-Man and the Wasp would fit that description for the Avengers; Sue Storm for the Fantastic Four; Nighthawk for the Defenders; the Angel for the Champions; Tigra for the West Coast Avengers; a toss-up between Marvel Girl and the Angel for the X-Men. 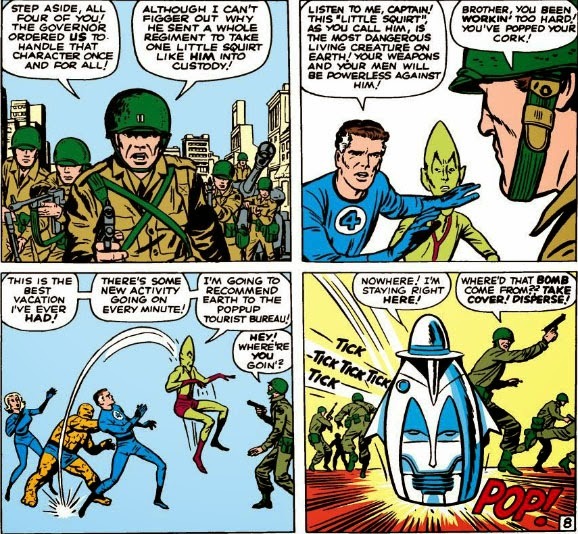 For the original Guardians of the Galaxy, who premiered in January of 1969, you might think the team's member in that respect would be the vulnerable Vance Astro--"the 1000-year-old man" who at first had to guard against his copper suit being punctured, exposing him to air and causing him to age rapidly to his death (nevermind how the guy managed to breathe); but Astro would prove to be resourceful as well as a decisive leader, and he also had a formidable "psyke-blast" to use against opponents. The Jovian, Charlie-27, of course had his massive bulk and strength, gained when his form was adapted at birth to withstand the conditions of his home, Jupiter--while Martinex's crystalline form was similarly adapted for life on Pluto, combined with the ability to convert light waves into extremes of heat or cold. Which left us with Yondu--a native of Centauri-IV, the planet Astro would arrive at after his 1000-year journey from Earth. 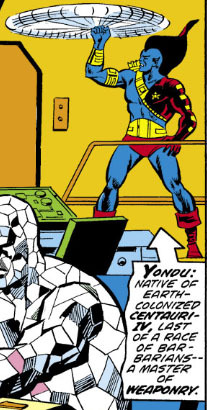 Yondu's name was just used once in that first issue, and only by a Badoon guard in passing; and while Centauri-IV was an Earth colony, he couldn't share the same sense of pride that the other three Earthmen did when they chanted "Earth shall overcome!" when they decided to band together to bring humanity back from the brink. 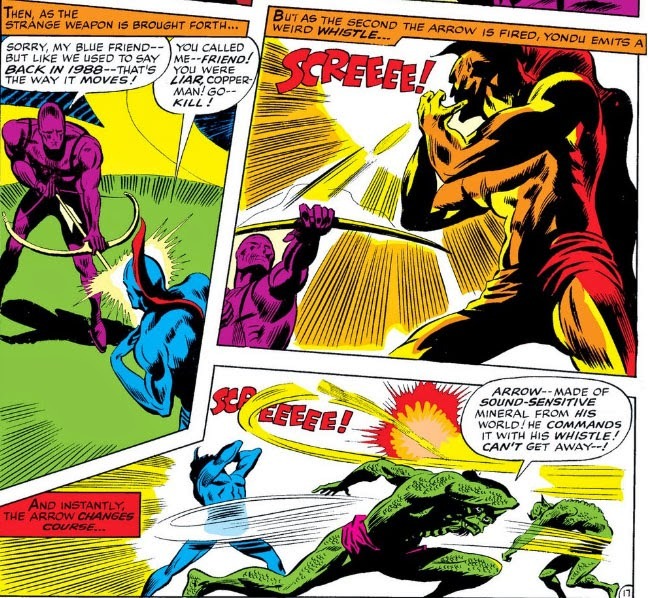 Yet Yondu could still battle alongside the three against the enslaving Badoon, who had given him common cause with these men when the aliens conquered his own race along with Earth and its other colonies--and he had other things to bring to the table, though it didn't seem so at first glance. 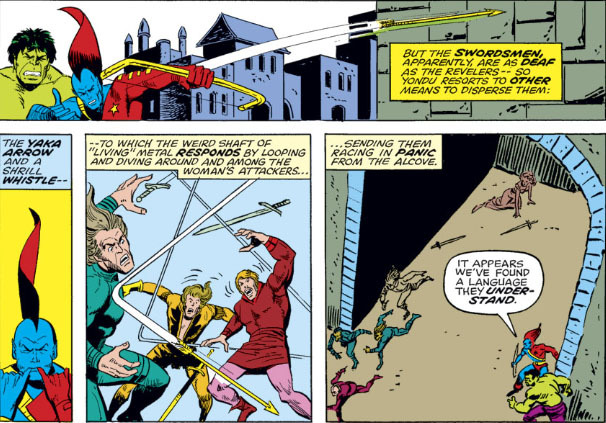 And if you're agreeing that there's little of substance to Yondu here, you may have stopped to ask yourself: If the "living metal" of Yondu's yaka arrows reacts with his whistle commands to make a much more deadly projectile, why would he need to be given a bow? 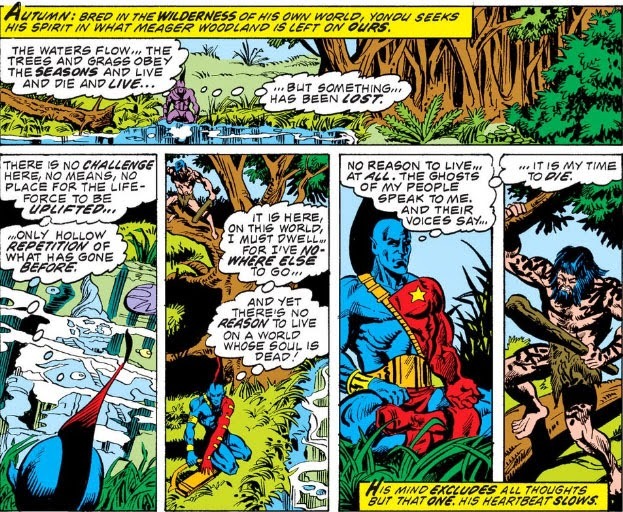 On the other hand, this scene also demonstrates the possibility that the series might pour on Yondu's spiritual nature a little too heavily, which would have his character bordering on becoming a cliché; the Guardians don't need David Carradine as a member, after all. But for the present, Yondu's development has finally allowed him to "balance" the Guardians, rather than detract from them. 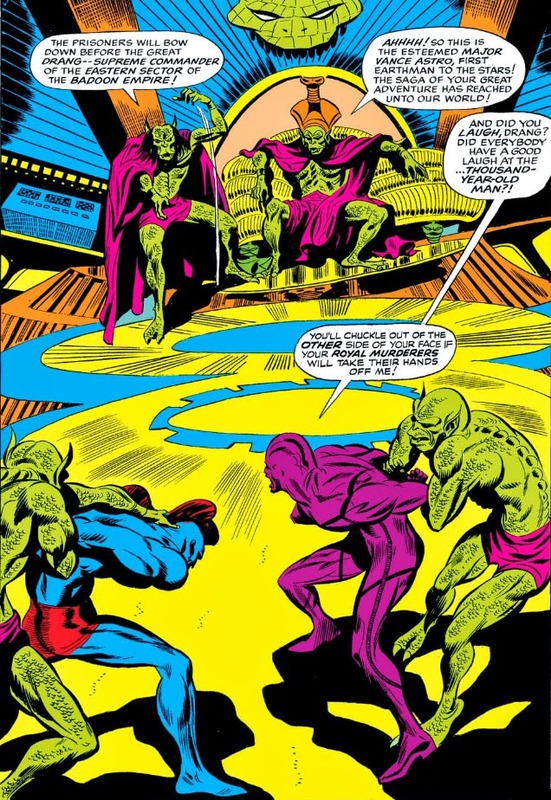 Now that Earth has been freed from the Badoon, and the Guardians have chosen to pick up the pieces of their lives off-world with their enigmatic fifth companion, Starhawk, it seems that Yondu is now a full-fledged member of this group, rather than on the fast track to becoming a fifth wheel. The End Of A Legend! 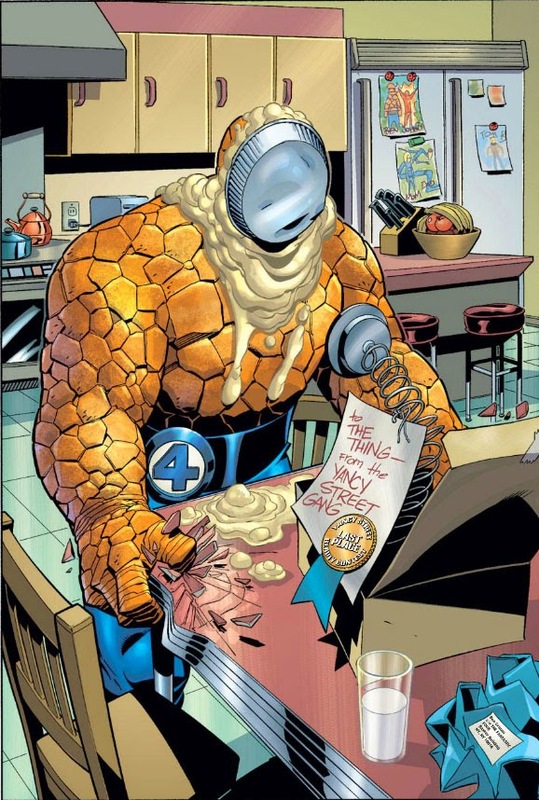 The Thing, once again sent a mysterious package that's been booby-trapped by the infamous Yancy Street Gang, Ben Grimm's nemeses from his old neighborhood that get their kicks from harassing him with pranks designed to humiliate him. 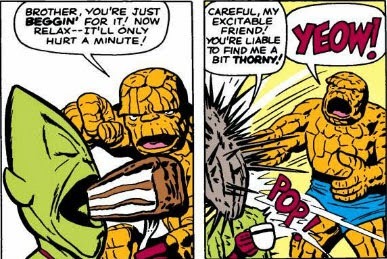 The shenanigans of the Yancy Street Gang were among those mainstays in Marvel Comics you could depend on, like Dr. Doom's facial damage or the death of Bucky--foundations of the Marvel universe that were always good enough as is and never needed to be tinkered with. 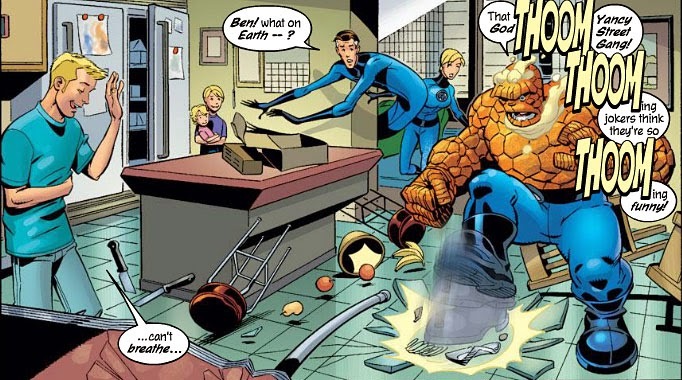 But in late 2002--after forty years of watching the Yancy Street Gang prevail against the Thing and waiting to see what they would come up with next--writer Mark Waid pulls the virtual rug out from under us. Johnny of course would be the natural choice as the culprit if the YSG were going to be taken off the hook. The question is, why bother with a new angle? This story is well written and funny--but we've spent years getting perpetual mileage out of the YSG, regular Joes who proved they could slip by FF security and nail the Thing over and over. Was it getting "old"? Did identifying the Gang deprive the pranks of their anonymity and fun? 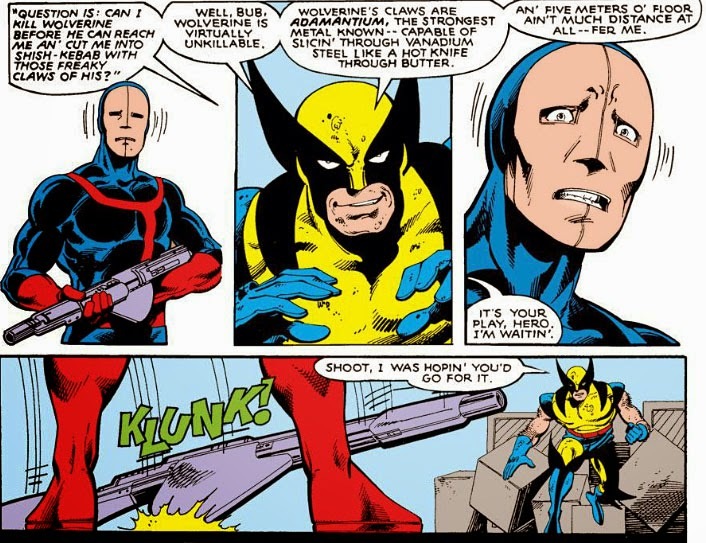 Whatever Waid's reasoning, this one story effectively puts an end to a good chunk of Marvel history that will be missed. Not surprisingly, no one knows what to make of the Impossible Man, who takes the slightest comment or suggestion from practically any human and runs with it. Institutional authorities are baffled by the alien's tendency to disregard procedures and/or rules--while law enforcement hasn't a prayer of containing him. The Impossible Man finds the human race to be, for all intents and purposes, stimuli--and with the number and variety of humans on the planet, and each and every one reacting differently to him, his potential for misunderstanding or inappropriate action is virtually limitless. You have to hand it to your adoring public--they'll turn on you like *SNAP* that. Nevertheless, everyone follows Reed's advice, and they soon find their reckless menace has become bored out of his mind. 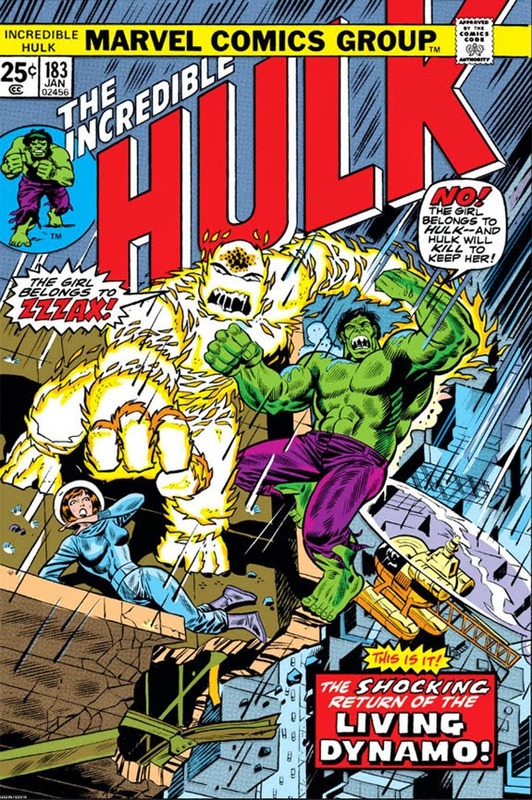 In combination with Part One of this issue, the entire book was likely well-received by readers, a harmless change of pace that was still engaging and fun. 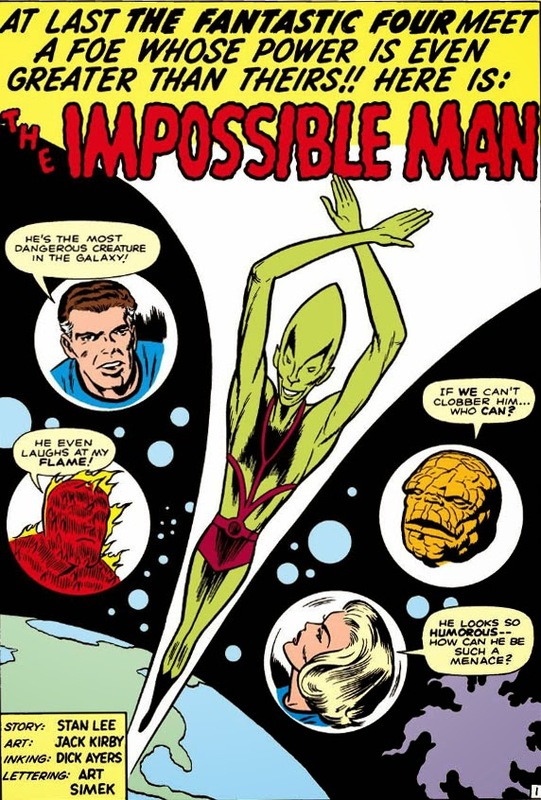 Things with the FF would be back on the front burner the next month, when the team would have its first meeting with the incredible Hulk; but fans of the Impossible Man would see him again when he'd deal a mortal blow to Galactus, and then later invades the Marvel Bullpen. 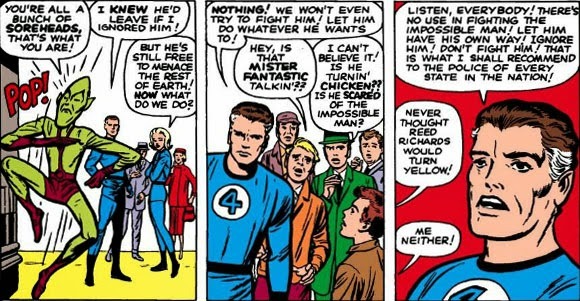 Don't look now, Stan, but the Impossible Man wants a word with you! My Unabashed Letters to Marvel! A Visit With The Fantastic Four! Attack of the Living Dynamo! The Deadly Aim of--Mr. Rasputin! What Lives Within The Cocoon? The Monarch Or The Mayhem? Marvel's On The Move Again!